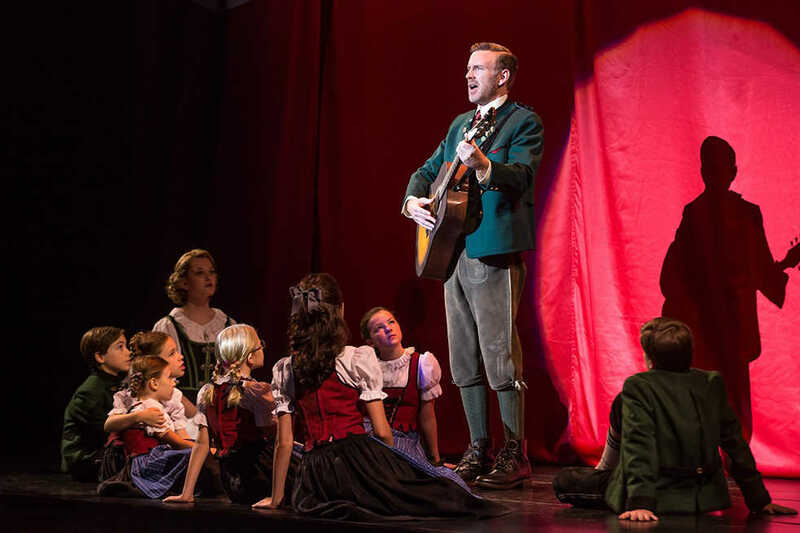 “Rodgers & Hammerstein’s The Sound of Music” opened Tuesday night at the Fox Theatre to a crowd of over 3,500 people. The high attendance was indeed warranted; the production was top-notch in almost every aspect. Casting was one particular category in which this particular production excelled. Compelling and convincing performances were abundant, as every actor was able to more or less take on the form of his or her character, immersing himself or herself entirely in the role being portrayed. Maria Rainer is played by Kerstin Anderson, and the musical’s other main lead, Captain Georg von Trapp is portrayed by Ben Davis. Anderson offers a very energetic rendering of hew musical character throughout the show, which proved to be a little awkward during the more somber scenes but for the most part was captivating. Davis, who is most known for his work in Broadway’s 2006 revival of “Les Miserables,” similarly brings fervor and liveliness to his role as the von Trapp family’s father. While surprising at first, this deviation from the usually more restrained Captain is easy to become accustomed to during the course of the production. Other nods are due to certain members of the supporting cast, especially Merwin Foard, who plays a very likable and jovial Max Detweiler. The character is not typically the most notable, but Foard provides consistent and expertly delivered comic relief throughout the show. Recognition is also due to the actors and actresses who played the various von Trapp children. The roles of young children tend to be very difficult to get correct, but this production pulls it off rather well, especially considering the non-trivial number of speaking lines for Gretl and Brigitta, two of the youngest children (Audrey Bennett and Svea Elizabeth Johnson, respectively). In addition to the stellar acting, the sets and design were noteworthy, especially in the initial scene in which Anderson is laid out as if in a painting. An illustrated backdrop of mountains are paired with a small bridge structure upon which Maria sits. Fog is pumped across the floor of the stage, and a film-like screen is lowered to give the scene a somewhat hazy quality. These elements combine to create an illusion that Maria is part of the backdrop, at least until she begins to sing. This trick is very convincing. Speaking of which, the singing of “Edelweiss” is easily one of the most powerful performances throughout the show by the cast. Other close contenders include Captain von Trapp’s first rendition of “The Sound of Music” as well as “The Lonely Goatherd” by Maria and the von Trapp children. Other songs, primarily “My Favorite Things,” are to some degree exhausted by repeated reprisals with little variation. This most recent North American tour of “Rodgers & Hammerstein’s The Sound of Music” has been directed by Jack O’Brien. It will be playing through Mar. 6 at the Fox. Student Rush tickets are often available before Off-Broadway shows through Thursdays.